I inserted the photo using the Users and Groups package and the photo is accepted and displayed(see screenshot). It is also displayed in the authentication screens and the logout screen, but NOT in the login screen. Lightdm is not used any more after the switch to gnome-shell. The login screen is handled by gdm3. 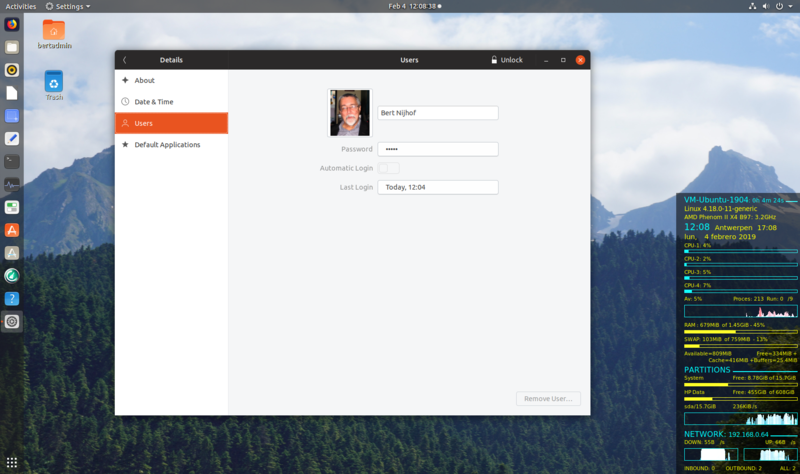 Actually the login screen is rendered by 'gnome-shell'. I wonder - can you please find the photo file and tell us what its permissions are? then reboot and tell us if that fixes the problem. is not displayed in the login screen but in all other screens after login. properties for others was none. > Actually the login screen is rendered by 'gnome-shell'. > then reboot and tell us if that fixes the problem. The login screen runs as a regular unprivileged user 'gdm' (not root) so it does (apparently) require that you make any images world-readable in order for user 'gdm' to be able to read them. Anyway, this doesn't seem to be a bug so I will close it. > order for user 'gdm' to be able to read them. > Anyway, this doesn't seem to be a bug so I will close it.